The Mail publishes a photo this morning of some scruffy git in a waiter's jacket onto which some items of bling have been inexpertly fastened; a gorget patch has come adrift, outsized epaulettes distort the thin catering-suppliers' fabric, the thing sags, like a canvas sack or those £9.99 'top gun' fancy dress outfits from eBay. 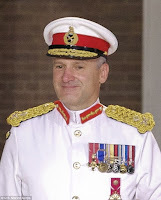 It turns out the smug but scruffy git is HM's new governor of Gibraltar, and previous Royal Marines boss, whom the Mail accuses of being complicit, with his red-tabbed and thick-ringed chums, in throwing Sergeant Blackman to the dogs to suppress criticism of fellow naval and RM officers. Sigh. Twas ever thus. There is nothing more disloyal and self-interested than a senior officer who may catch some passing flak from an incident. They're about as reliable as chocolate teapots, and Len Murray could have learned a thing or two about the trade-union of general officers. The Mail story tells how they bullied and diverted witnesses, doctored reports to remove any criticism of anyone except Sgt Blackman and have consistently blocked and sabotaged review of Blackman's conviction. Biggles and his chums in their three or four working aircraft are now engaged in flying very fast over Syria and sometimes dropping munitions on disused buidings and olive groves, accompanied by hundreds of MoD press officers enjoying the Winter sun in Cyprus eager to feed journalists with footage and photos of Biggles, close-ups of his warplane, stunning aerial shots and anything in fact other than illustrations of the virtual insignificance of our Syrian contribution. With much sound and light, Cameron has deftly deflected attention away from his most grievous screw-up - the mess in Libya. Libya, gateway to Europe for a tsunami of Mahgrebi and black Africans, rootless, without skills, eager for the wealth of the West. And Daesh-IS, now established in Libya and attracting support for a Caliphate from every dumb, poorly educated Islamist in Africa and a few dumb Islamist dicks in the UK, expensively but pointlessly educated. Perhaps Biggles can persuade Algie to take his very last aircraft to Malta (with a hundred or so MoD press officers) to fly sorties over the real enemy? Libya will haunt Cameron in the final, sterile period of his office, with Blair, like some zombie ghoul in the background, a momento mori to a failed political life. A silent TV news screen high on the wall in a crowded and noisy Christmas pub prompted the barked question "Isn't that bloody man in prison yet?". No, it wasn't Anjem Choudary but Bloody Blair, trying for yet another comeback and desperate for media attention. And the questioner was a normally calm and emollient QS, which means my own dislike of the greasy toad has now gone mainstream. Excellent. A civil claim by Lee Rigby killer Adebolajo for having all his front teeth knocked out in prison must surely be doomed to failure - if not on primary grounds then on the basis that young men without front teeth enjoy an enhanced earnings capacity in the internal economies of our prisons, and Adebolajo has a lifetime of service before him. The revelation that some Tory boys are utter shits is hardly surprising. More amusing is Iain Dale's weird wriggling to give an impression that this is complete news to him. I do like Iain, but sometimes his loyalty to a party that doesn't discourage such nasty little turds is somewhat strained. The YCs, before they were abolished, were the only youth party in the nation that thought bottles of Rohypnol were appropriate Christmas presents. The current debate is about how many in the party knew that the youth wing were led by bullying nasty Toryboy shitehawks; the honest answer must be just about every Tory over 30, but the 'official' enquiry will no doubt decide that, like the Germans and the extermination camps, 97% of Tories knew nothing. Hey ho. What would Edmund Burke have said? What would Burke have said to Donald Trump's suggested ban on Muslim immigration to the US? Disappointingly, he may have been in favour - but only on grounds of risk to the nation, not on grounds of religious discrimination. Burke fought hard for Catholic emancipation in England but was one of the chief proponents of the 1793 Aliens Act that restricted and regulated French immigration on the grounds that regicides and revolutionaries may sneak in with the refugees. Not an easy one to call, though. But on Marine Le Pen and the FN I think the answer is unequivocal; he would have hated her and everything she stands for. Le Pen's National Socialist party, the heir to Laval's and Darlan's Vichy regime, with its central State control, socialist command economy and ruthless fascist authoritarianism is the utter antithesis of everything that Burke and England stood for; he wrote ""Individuality is left out of their scheme of government. The State is all in all. Everything is referred to the production of force; afterwards, everything is trusted to the use of it. It is military in its principle, in its maxims, in its spirit, and in all its movements. The State has dominion and conquest for its sole objects—dominion over minds by proselytism, over bodies by arms". One aspect of Europe's 20th century history that doesn't often make it to mainstream popular history output is our own record of ethnic and linguistic 'adjustment', behind which lay stories of cruelty, heartbreak and unbearable grief. It is perhaps because such history still has the power to motivate strife that we as Europeans choose to bury it - and why no Simon Scharma, Antony Beevor or BBC producer has sought to revive it. Sometimes a cine camera was accidentally present to capture a hint of it - the column of wounded and cowering ethnic German DPs who had just been machine-gunned by ethnic Czechs who then drove a 4 ton lorry over their legs. Most frequently the horrors are buried and hidden, and parents and grandparents who witnessed such things are taking them to the grave. I have maps of Europe that span pre-1914 to post-1945 and that document how the lines moved in 1919 and in in 1946. Each tiny movement a million people, a thousand years of family rootedness, an ocean of tears. The Slovenes left in Austria after the 1920 plebiscite, the Tiroleans left in Italy, the German mini state in the Balkans, Poles, Ruthenians, Silesians, Alsations, German, French, Czech, Slovak, Slovene, Slavone. And such adjustments, if not accelerated by a little local genocide, continue still today. The smaller the remnant of a minority gets, the more zealous to preserve its language and local place names, and such concessions are made these days, until the last unassimilated people disappear to leave just a few badly remembered words and some interesting recipes. All of this is why the mainland Europeans are so much keener on the EU than we are. It is not to preserve peace between sovereign nations, not to prevent the rise of dictators but to save us from our neighbours who wear a different patterned headscarf. To prevent the midnight banging on the door, with the boys being dragged off to a ditch to be shot. Here in the UK we have no folk history of it - except perhaps in Ulster, far removed from 97% of us. As anyone has ever undergone a corporate restructuring will know, the changes are frequently not at all scientific and with little rationale. Once the main pieces on the board have been traded and the big knobs want to go home, the little pieces are swiftly repositioned so as not to disturb the main deal. So Health and Safety finds itself reporting to the Marketing director. Versailles and Yalta were the same. The bell had gone for dinner, so a ruler or a river and a blue pencil solved the final boundaries. 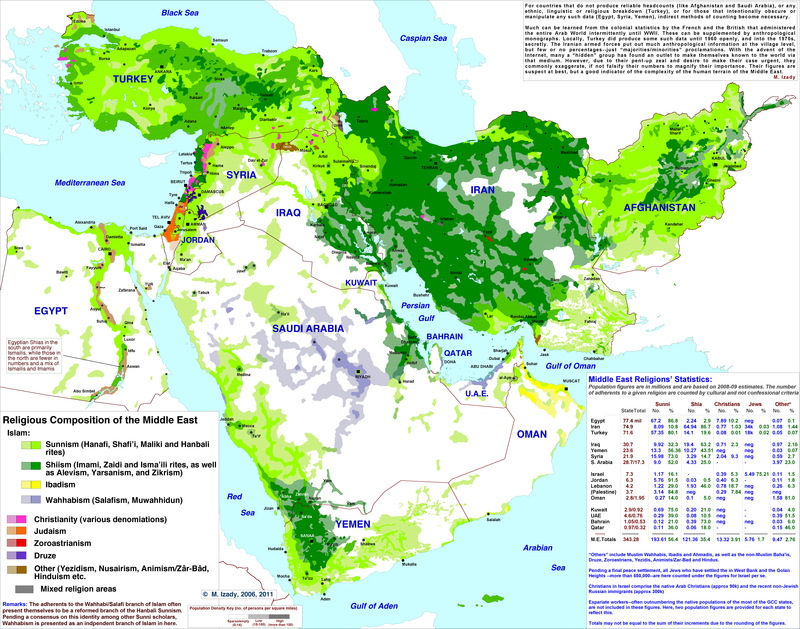 For anyone looking at the following two maps of the middle east, remember that the lines of 20th century Europe were simple and the numbers in the millions not the hundreds of millions. No polemic today, just quiet despair. We have to make clear to the Saudis that the time of looking away is over. Wahhabi mosques all over the world are financed by Saudi Arabia. Many Islamists who are a threat to public safety come from these communities in Germany. Saudi Arabia is amongst very few regional nations not taking any Syrian refugees (Israel is another) yet has sought to build an extra 200 mosques in Germany to extend the country's bloody ideology of Wahhabism. It is suspected that filthy Saudi money is behind many of the radical mosques in the UK that have produced Islamist terrorists, self-exploders and Daesh Islamist Scum volunteers. 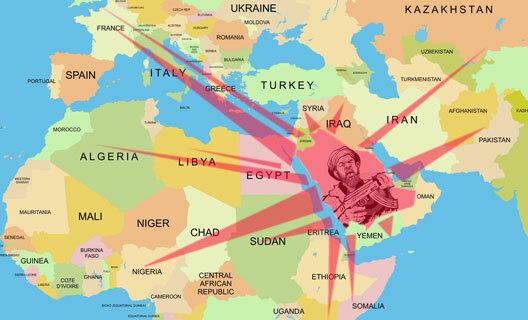 In January of this year I termed the barbarian KSA the new Heart of Darkness, exporting its evil ideology throughout the world. The graphic above understates the influence of the primitive savages of the goat-kingdom; a yachting correspondent with experience of cruising Turkey's northern coast reported a new Wahhabist mosque funded by KSA at every town of size. Europe has a far greater prospect of peace and economic health without Saudi Arabia; if Cameron's crooked chums have to forgo their butcher's geld, so be it. How I wish I could tag this story 'whimsy' but sadly it comes under the 'strange but true' category. 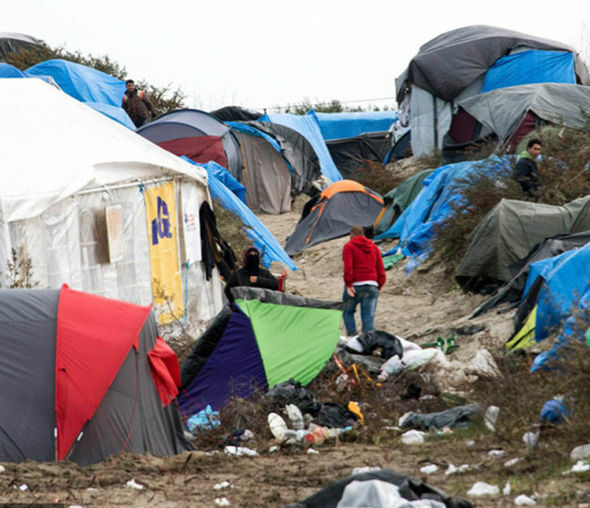 The bien pensants of the 'no borders' variety hve decided that what the migrants of the 'jungle' camp in Calais really need (more than antibiotics, DDT, fungicides and soap and water) are .... third-rate English face-painters, jugglers, mime artists and unicyclers. Lefty circus workers are being regularly bussed across the channel to give 'classes' to the incredulous migrants. I really, really hope they all come back with lice and scabies.